For $3,500, Will This 1982 Honda CX500 Turbo Blow You Away? Shakespeare averred that brevity is the soul of wit. If that’s true then the seller of today’s Nice Price or Crack Pipe Honda CX500TC must be a freaking genius. 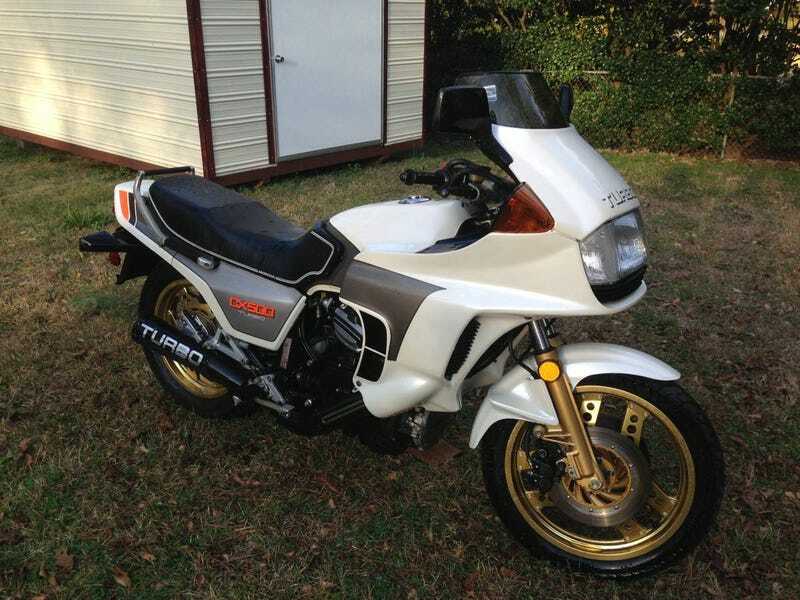 We’ll still have to decide if you’d be a nitwit to pay his asking for this rare turbo bike. Quite a few of you thought there was something fishy about yesterday’s SBC-rocking 1990 Volvo 240 DL, and I don’t mean a congealed mass of fish-shaped gummy treats left in the glovebox. No, it was the note of the recent transmission rebuild that raised red striped flags. Why sell the car after just having such major a job completed? We shall perhaps never know the answer, but we do know that it wasn’t enough to overcome that Volvo’s undeniable draw and it came away with a narrow 58-percent Nice Price win in spite of the intrigue. Today’s 1982 Honda CX500 Turbo is the equal of that Volvo in earning our interest seeing as it a bike of firsts for Honda, the world’s largest motorcycle maker. Café clad and equipped with jazz hand three-spoke wheels, the CX500 Turbo was not just Honda’s first forced-air production machine, but also its first road bike with fuel injection. The bike upon which it was based—the standard CX500—was additionally Honda’s first ever production V-twin. That twin here is a water cooled 497-cc OHV unit in an 80° configuration in line with its shaft (John Shaft) drive. The turbo is by IHI and sits in the airstream just ahead of the motor. Power output when new when so configured was a quoted 82 horsepower at 8,000 rpm.. The rest of the bike was as innovative as the mill, featuring Honda’s Pro-Link monoshock rear suspension, and TRAC (Torque Reactive Anti-dive Control) front forks that tied braking pressure to the fork valving to limit dive under heavy braking. All that’s wrapped in wind tunnel tuned GRP bodywork, and features a pair of black-painted exhaust pipes emblazoned with TURBO badging. It’s a good looking bike, albeit one that gives the uncanny appearance of one a cop might ride. Contemporary tests praised the bike for its on-turbo power, comfort and Honda-quality controls, while the bike was dunned for its weight (571-pounds wet), lack of low-range grunt, and non-linear power application. Hey, nobody’s perfect old Cycle Mag testers! Unfortunately for Honda and the CX500 Turbo, the motorcycle market in the U.S. pretty much collapsed in 1982, the year of the bike’s release. The Turbo would see only about 5,400 units moved that year, and even bumping displacement to 673-ccs and increasing horsepower to an even 100 in ’83 wasn’t enough to save the bike. After only two short years, the Turbo was no more. This one brings back all that glory and if a picture truly does speak a thousand words then its ad is like reading War and Peace. All it notes in words is that the bike has but 4,300 miles on it, and that more pictures are available if you ask. It’s the pics that are available that tell the bike’s story, however. The seller seems to have done an admirable job denoting all the boogers on the bike, including a broken turn signal lens and mount, a cracked headlamp outrigger, chipped paint in places, and some surface rust. Taken all together that makes this a ten-foot bike, which still ain’t a half bad thing to be as long as it runs half decently. Turbo-specific parts like the plastic surge box aft of the turbo are likely difficult to source, as would be any missing bodywork. This one seems all intact even if some of those parts are showing their age. No word on tire age, brake performance or whether there are electrical gremlins afoot is proffered, so we’ll have to go on faith and assume that it’s all okay. The asking price is $3,500 and to be honest it’s a bit of a tough call as to the market for these beauties as they simply don’t show up for sale all that often outside of the fan forums where prices aren’t likely to reflect real world sensibilities. You’re all pretty sensible, and seeing as such, what’s your take on that $3,500 price for this rare old Honda? Does that make this twin a win? Or, does that price make this turbo a high-pressure loser? Atlanta GA Craigslist, or go here if the ad disappears. H/T to P161911 over on Hooniverse for the hookup!